There are so many worthy animal charities in need of donations, it’s always a difficult decision to try to figure out who is truly struggling and who might be able to make a dollar work the hardest for their particular organization. Certainly our local shelters are a good place to start, but I tend to think about those even smaller non-profits that struggle on a day-to-day basis. Many of these little organizations exist completely through donations from people like you and me. They can’t afford to advertise, or would rather put whatever funds they receive directly into helping those animals in their care. One such place that you may not have heard about is The Animal House of Jamaica. A non-profit, non-government organization that operates a shelter in Lydford, St. Ann, just outside of Ocho Rios, Jamaica, The Animal House of Jamaica was opened in the 1990s by British-born Maureen Sheridan. 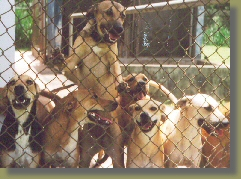 The shelter provides food, shelter and medical care and more for Jamaica’s stray, injured abandoned and feral animals. Sheridan’s is working hard to overcome generations of accepted behavior that can include mistreatment of animals, and is focusing on Humane Education as well as being a proponent of spay and neuter, and immunization programs. Here’s a bit of video with a voice-over by Sheridan, introducing you to some of the shelter’s dogs, as well as telling some of her success stories. The Animal House is one of only two shelters in Jamaica and is the only no-kill shelter on the island. For more information, including an interview with executive director Maureen Sheridan, please click on this link. 100% of donations made to The Animal House of Jamaica go directly to their animals. Sounds like a pretty good return on your dollar, if you ask me. So, when you are making your year-end contributions, I hope you will consider donating whatever you can to this amazing non-profit. You can become a fan of their Facebook page as well, and help spread the word about the important work that they are doing.